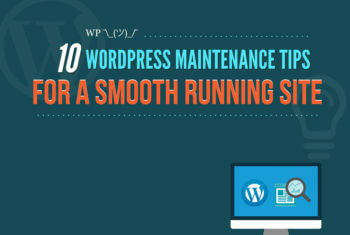 I came across this useful infographic of 10 WordPress website maintenance tips. It covers all the main points of how to maintain a WordPress site and keep it running smoothly. It’s interesting how many of these WordPress maintenance tasks are covered simply by choosing the right WordPress web host. I decided to write this post for people whose websites are hosted by WP Engine, our recommended hosting company. This will help you to understand which maintenance tasks you still need to do for your website, and which WP Engine will take care of for you. It applies whether you sign up direct with WP Engine or use Barn2 Media’s hosting service. YES!!! It’s amazing how many people get a professional WordPress website (or even a cheap website) and think that’s all they need to do. Before long, the website languishes and things start to go wrong. You can learn why in my article ‘Do WordPress websites need maintenance?‘ For now, I’ll just say that maintaining your website is absolutely vital – whichever host you use. A neglected website will be vulnerable to hacking, errors will start creeping in, the content will go out of date and your search engine ranking will drop. You don’t want that, so follow these tips or sign up to our WordPress maintenance services to keep your site running nicely. WP Engine take daily backups of your site which are stored for 1 month. It’s incredibly easy to roll back to a previous backup (unlike most hosts where this is quite technical to do). You can easily take extra backups whenever you like, for example before making a big change to your website. When using other WordPress hosts, I have always had problems with backups. For example, some of the daily backups would be missed – usually when I urgently needed that day’s backup! I have always found WP Engine backups to be completely reliable. Unless you have a real need for longer-term or offsite backups then you don’t need to worry about backups as part of your WordPress website maintenance. Even if you do decide that you need additional backups, this shouldn’t be part of your maintenance schedule. Find a service such as BackupBuddy that will take automated offsite backups for you. WP Engine will keep WordPress itself up to date for you. Other software updates are still your responsibility and you need to keep your theme and plugins up to date. Regular software updates are the single most important thing you can do to protect your website from hacking. This is one of the most vital tasks in your WordPress website maintenance schedule. If you use a ThemeForest theme, it’s easy to accidentally let things out of date without realising. This is because the theme can’t be updated from the usual ‘Dashboard > Updates‘ page in the WordPress admin. Your theme may also have bundled plugins that – strangely – can only be updated by deleting them and following the onscreen prompts to reinstall them. With premium themes and bundled plugins, there may be no notice that an update is available and things can get severely out of date. The safest option for this part of your website maintenance is to sign up to our weekly software updates service. We know how to make sure everything stays up to date and nothing is overlooked. Whether you do your own updates or let us do them for you, don’t let your theme and plugins get out of date. Seriously. WP Engine have robust security tools and scanning in place. They say that if you use their WordPress hosting then you don’t need any other security plugins for your website. This means that you don’t need to include this in your WordPress maintenance routine. Whichever web host you use, your WordPress database is likely to get cluttered over time. Every time you save a page or post in WordPress, the revision is stored in the database. All your comments – even spam comments – are stored. Various other data is also stored behind the scenes. We recommend using the WP-Sweep plugin to tidy up your database every now and then. Set this as a monthly or quarterly reminder to do this as part of your WordPress maintenance schedule. It can make a subtle but important difference to the performance of your website – especially if your site is a few years old. No hosting company will check your website for broken links. And despite my optimistic post about this feature being added to WordPress 4.6 a few months ago, in practice I haven’t found it to be very useful. Sign up to a paid service that will automatically check your website for broken links on a regular basis. If you don’t want to pay, set a reminder to do this when you maintain your WordPress website. I find that Dead Link Checker is the best free link checker but let me know in the comments if you find a better one. I love receiving comments on the Barn2 Media blog, and can’t understand why anyone would let them pile up. However I have seen this happen many times on our clients’ websites. Comments are really important. They show that visitors are engaging with your site and add credibility. Responding appropriately to comments shows that you listen to your visitors and give your website a voice. They also help your search engine ranking. If people are adding genuine comments to your site, you really should approve these quickly and reply to them. If most of your comments are spam then I do understand why it’s tempting to ignore them. However it’s best to tackle the problem directly and reduce the spam! The best WordPress anti-spam plugin for comments is Akismet. Akismet is only free for personal websites and non-profits, so if you want a free alternative then WordPress Zero Spam is also good. Once you’ve stopped the flood of spam comments, it will be easier to stay on top of comment moderation as part of your ongoing WordPress website maintenance. We’re often contacted by clients whose websites went live ages ago asking how to access their Google Analytics. I’m always amazed that they have never been interested in finding out how many people are visiting their website – let alone the wealth of other information it records! Don’t be one of the many people who set up Google Analytics and then forget about it. Your analytics software provides essential insight into how people are interacting with your WordPress website. As a minimum, you can learn a lot simply by taking a quick glance at the analytics dashboard. At the other end of the scale, you could spend days delving into the data and analysing how people are using your site. Either way, this is a fantastic opportunity to streamline your site and make it more effective. Ultimately, this can increase your sales – or whatever you want to achieve from your website. If your website aims to convert people in some way – whether this is through e-commerce sales, contact form submissions or newsletter signups – then you can also use Google Analytics to track these as goals. For example we track the plugin sales on our website, using Google Analytics to discover how people are finding our site, how many people abandon the checkout at each stage, etc. We use this to improve our website and increase sales. For all these reasons, I recommend making analytics monitoring part of your WordPress website maintenance. Set a regular date (e.g. every 3 months or more) to analyse your traffic and look for opportunities for improvement. It can only make your website more successful. WP Engine test your website after they update WordPress on your behalf, but the rest is your responsibility. A lot of people blindly follow their WordPress maintenance schedule and once everything is updated, they think “Job done”. It’s really important to test your website after making changes – especially after WordPress/theme/plugin updates. You don’t have to spend hours doing this and you can speed up your website maintenance by writing a list of key things to test. As a minimum, you should test each of the main layouts/templates on your website and all the main functionality. This ensures that no conflicts have been introduced and nothing has broken that you’re not aware of. It’s much better for you to spot these issues than your customers. And last but not least, SEO (search engine optimisation). If you want new people to find your site then SEO is an essential part of your WordPress website maintenance. This is completely separate from your web hosting – you need to do it whichever host you’re using. There are plenty of helpful guides on optimising individual pages and posts for SEO. For example you can check out my post on how to use your blog to boost your SEO. However this page is about WordPress maintenance. As a maintenance task, I recommend reviewing the SEO of your existing content to ensure there are no gaps. The easiest way to do this is using the Little Hippo WordPress plugin which I reviewed a while back. Little Hippo analyses all your content and tells you which posts/pages/portfolios/etc. have missing title tags, descriptions, image alt tags and other SEO data. You can then fill in the gaps all from one page. As you can see, using a good host like WP Engine makes your WordPress website maintenance slightly easier. It means you don’t need to worry about tasks like backups, security scans or WordPress core updates. However everything else is still your responsibility. I recommend setting a reminder (using Google Calendar or similar) to spend half a day on WordPress website maintenance every month or so. Write a list of regular maintenance tasks and repeat the process each time. If you’re unlikely to find time for this, or would feel more comfortable with a WordPress expert overseeing your website, then check out our WordPress maintenance service. This mainly covers ongoing software updates and testing. You can add extra support time to your package and we can agree which of the other maintenance tasks you’d like us to take care of. Alternatively, if you get a cheap professional website with our affordable web design service then we provide updates and general maintenance as part of the basic cost. Whatever your plans for WordPress website maintenance, make sure your website will be properly looked after.You can then relax knowing your website is in good hands and will keep running smoothly into the future. Hi Katie, One of the biggest website maintenance problems with WordPress is Google index bloat, especially with large blogs and eCommerce sites. A good tip we have found is to use Yoast to noindex archive, author, tags, and category pages (depending on your website type with the last one). Going through your sites search results in Google (site:yourwebsite.com) and requesting removal of all these duplicate urls as above (and any old/dead indexed pages) has returned some great ranking results within a short space of time. Thanks for the tip, I completely agree. This is great. I will put this to good use on my WordPress website.